The use of "zeg maar" is a bit of a plague in the Dutch language. Many people use it constantly as a filler. Being a filler, "zeg maar" doesn’t really mean anything. In fact, one could argue that it only shows that people who use it, are not really sure of what they’re saying, or are only just babbling on. 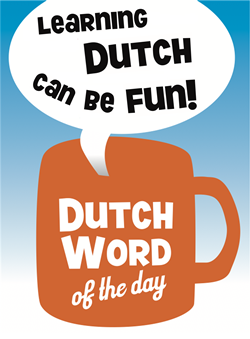 There’s no literal translation of "zeg maar", it is best translated with "let’s say". Literal translation of "let’s say" is "laten we zeggen", which is also often used as a bit of a more formal filler, but not as often as "zeg maar". – "Als ik naar dat schilderij kijk, krijg ik een warm gevoel, zeg maar." – "Snap je, zeg maar, wat ik bedoel?" – "Als je na een hete sauna een koud bad neemt, is het, zeg maar, alsof je even niet kunt ademen." – "Laten we zeggen": (lit.) let’s say. – "Weet je": you know. – "Stopwoord": filler. Literally "stop word". You also often hear ‘stopwoordje’. I wish I found this site earlier! Really really nice and extremely handy. does this means that we cannot use “Zeg maar” to say for example “Say hello to sb”? Thanks a lot for your daily explanations, that’s great! I knew a Belgian girl who would often start an English sentence with the words “I say!”, which always made me think she had been (or thought she was) a member of the English aristocracy. ‘Zeg maar’ can translate to “let’s say”, but not really to ‘I say’. In the case that she started a sentence with “I say…”, it is more likely that she translated directly from Dutch: “Ik zeg …”. Although that literally translates to “I say”, it is more likely to mean something like “I claim”, “I am of the opinion” or “I want you to / I order you”, depending on the context.